(Above) Our Office in Downtown Jacksonville, Illinois - Directly across the Street from the Morgan County Courthouse. Voted "#1 Real Estate Firm in the Jacksonville area, 2004-2005" by the Jacksonville Journal-Courier, Readers Choice Award. See all of our listings also on seehouses.com. Bob Chipman is a licensed real estate broker and member of the National, State and Jacksonville Association of Realtors. Bob is past president of the local Association of Realtors. Bob has served as Chairman of the local Multiple Listing Service (MLS) for several years. 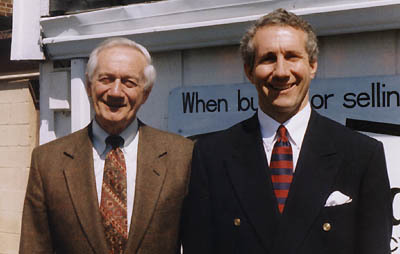 His father, the late Bill Chipman started the firm in 1956. Also, Bob Chipman is a State Certified Appraiser in the State of Illinois. Bob Chipman is a Graduate of the Realtors' Institute (GRI) and has held that designation since 1987. Chipman Realtors and Appraisers has been active in the Jacksonville, Illinois area real estate market for well over 60 years. We have assisted hundreds of local families with their real estate needs since 1956. 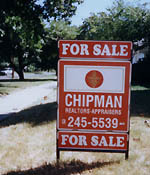 Chipman Realtors and Appraisers specializes in the sale and appraisal of residential, commercial and agricultural properties. The appraisal of commercial property is limited to smaller properties. Property is advertised in the local media, as well as the "Homes" magazine published locally by the Jacksonville MLS System. Bob Chipman is a community and civic leader, as was his father. The late Bill Chipman was inducted into the Jacksonville Hall of Fame. ©1998, 2014, Chipman Realtors and Appraisers.